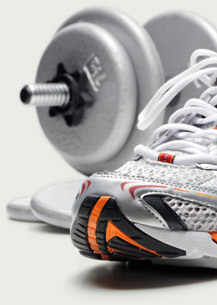 Aerobic exercise versus strength training: which is better? Posted in General Health & Wellness on September 7, 2011. Last modified on March 26, 2019. Read disclaimer. With a busy lifestyle, what's the best use of very limited workout time - running, biking and other aerobic exercises that get our heart pumping OR yoga, Pilates, weight training and other strength-building routines? It's best to do a bit of both -- since each exercise type provides unique heart, muscle and bone strengthening benefits. There is strong evidence to show that regular physical activity may help prevent the development of diabetes, obesity, reduce hypertension, improve bone strength, reduce signs of depression, sharpen mental function and even lessen the chance of an early death. Unfortunately, only 22% of us participate in even a minimally active exercise schedule (30 minutes per day, 5 days a week). That means 78% of us are leading a sedentary lifestyle! Before going into the various types of exercise activities and the benefits they may offer, the most important fact that almost all health experts agree on is... ANY form of regular physical activity is better than inactivity! muscle-strengthening (resistance) exercise: involves repetitions of lifting weights (or body weight) or stretching elastic bands. Critical for building and maintaining muscle strength. bone strengthening (weight-bearing or impact) exercises: includes activities that also qualify as aerobic or muscle-strengthening such as jumping rope, running, brisk walking and weight lifting. These activities put pressure on the bones to build or maintain their strength and may reduce or delay the symptoms of osteoporosis. How much time must I spend exercising each week in order to see results? The word "must" in that previous sentence brings up a common reason that so many Americans are inactive -- we approach exercise as a price we have to pay for good health rather than as a way to enjoy quality time with family and friends, doing something fun or enjoying the outdoors. The question about "time spent", however, is a valid one. Time (frequency of workouts and duration of each workout) combined with intensity (how much energy you are putting into the activity) are important to consider when planning your health goals such as: "how much weight I want to lose?" or "how important it is to bring down my high blood pressure or minimizing my risk of developing heart disease, osteoporosis, etc?" Medium activity: between 2 1/2 and 5 hours of moderate exercise per week (or half that amount of time if the exercise is vigorous). Can expect substantial benefits - especially as you approach the higher end of the time range. Highly active adult: exercises more than 5 hours per week and may see additional benefits. In fact researchers have not identified an upper limit at which health benefits no longer accrue. if your heart rate and breathing have increased significantly and you can't speak more than a few words without having to take a breath - that is a vigorous activity level. Where does strength-training fit into this? In addition to the previously mentioned aerobic activities, adults are encouraged to participate in muscle-strengthening exercises at least 2 days per week. This could include lifting weights, working with elastic bands, practicing yoga or doing pushups, pull ups, sit ups and other bodyweight resistance exercises. While performing a minimum of 1 set of 8-12 repetitions (to the point of failure) for each muscle group is suggested, additional benefits may be gained by increasing this to 2-3 sets for each activity. Feeling overwhelmed at just the thought of exercising 20 minutes a day (2 1/2 hours per week)? Don't let a time commitment intimidate you. Regardless of your age or whether or not you have disabilities, some physical activity is better than none. Physical and mental health benefits can begin to appear with as little as 1 hour of exercise a week, though significant benefits begin appearing as you increase the intensity, duration or frequency. And though some health benefits (such as reducing risks of cancer and heart disease) may take years to experience, other benefits such as improved heart and lung function, muscle strength, less depression and lowered blood pressure may begin to appear in as little as a few weeks. According to the US Centers for Disease Control, it should be safe for an average adult to begin moderate level fitness activities. Persons suffering from health conditions such as heart disease, arthritis, diabetes or those who experience symptoms, however, should discuss their fitness goals with a doctor. People who have been inactive may want to start with activities of short duration (10 minutes) and mild intensity, working up from there. Simply parking farther away from a store or office door and walking the extra distance could be your starting point!